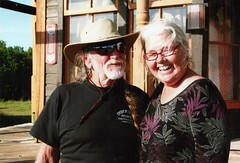 Hi, my name is Linda Banks, and I’m a Willie Nelson fan living in Colorado. You can e-mail me at Linda @ stillisstillmoving.com. Linda Banks, P.O. 1132, Erie, Colorado 80516. Look! 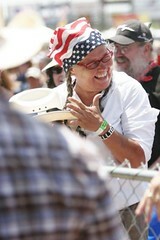 I caught Willie Nelson’s hat at the 2005 Picnic. 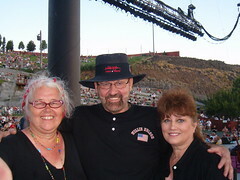 me and Billy English and Janis from Texas, at George, Washington on 7/4/07. 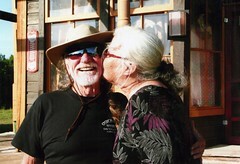 Hi Linda, my name is Jordan Dawes and I am one of the editors on a Willie Nelson Documentary that has been shot for the last year which includes interviews with all the family, band, and crew. We are editing now under very constrained time limits and we are trying to make the south by southwest film and music festival in March. I am scouring the internet and trying to get all the archive footage we can to implement into this documentary. 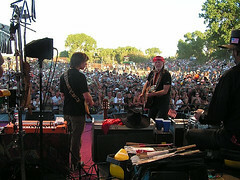 It has many luminaries like Kris Kristoferson, Ray Price, Woody Harrelson, Luke and Owen Wilson, Shelby Lynne, and a slew of other artists, musicians and friends of Willie. It was also directed and produced by Billy Bob Thornton. The reason of my contacting you is that I have found your website and have been downloading these incredible archive photos. Obviously I cannot use them due to copyright issues off the web, but I will be “getting” a lot of these from the family. If you have anything we can use it would be greatly appreciated. Any help will be incredibly welcomed by our small and meager editorial team of two. 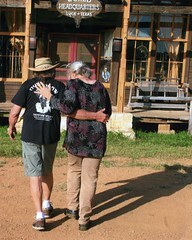 We are developing a really good look into Willies life, family and the Willie nelson experience. 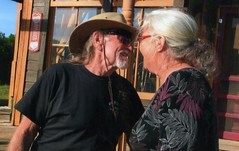 I’ve ben keeping up with Willie the past few years with your website. Great job. I lived in Abbott my whole life and of course there are a lot of fans here and anytime we want to know where’s Willie we just look on your website. Thanks a lot for keeping us up to date all these years. Ryan, thank you for your kind words! I love your town of Abbott; am always made to feel so welcome when I get to visit. Thanks for visiting the blog. Thanks for a fantastic site. We don’t get the chance to see Willie too much here in the UK so it’s great to come onto your site and just browse around, there’s always something new to spot. Please can I ask a favour? We get all exited when the fan club email arrives announcing future concerts, but then we find that they’re still in the US. With all your contacts, do you have any news of when Willies next European tour will be? (I emailed Club Luck a couple of months ago, but still waiting for a reply). Hope you can help and once again Thanks.